Please refer to our stock # 10856 when inquiring. 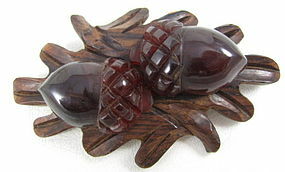 This charming vintage bakelite pin measures 3 3/4" long x 2" wide and has a great fall motif design of acorns. It has a layer of leaves carved from wood and has 2 tortoise tone bakelite acorns applied on top. It has a secure pin mechanism and it is in excellent condition. It's a great pin for that jacket lapel or pashmina scarf!